Wide Open Spaces Album reviews. Have you ever been in a smog infested slum and then driven into the country for a nice breath of fresh air? After having Garth Brooks and LeAnn Rimes shoved down my throat for the past year, the new album by the Dixie Chicks is a refreshing treat. Let me start by saying that I don't particularly like banjos. Likewise, I could do without mandolins. In my mind, those are bluegrass instruments, and for the most part, should stay such. However, banjos and mandolins as utilized on "Wide Open Spaces" are a delicious change of pace. Speaking of changing paces, this album has a wonderful way of never falling into a tempo slump. Some albums have a major problem with all of their ballads sounding the same, or all of their up-tempo stuff sounding the same, or both. That does not occur on Wide Open Spaces. The album ranges from the bluegrass feel of "Give It Up Or Let Me Go" (yes, the old Bonnie Ratio tune) to the traditional country feel of "Loving Arms" to the new country feel of "Let 'Er Rip." Most of the songs are up-tempo, but it's when the ladies slow down and sing a mournful ballad that they really shine. A good case in point is "You Were Mine." The song, written by group members Emily Erwin and Martie Seidel, starts out as a simple love gone wrong song, then throws in a line about the children her ex-husband left behind. It's a 90's version of Tammy Wynette's "I Don't Want To Play House." There are a million wonderful surprises on "Wide Open Spaces," which make it a all around delightful album. I highly recommend it. 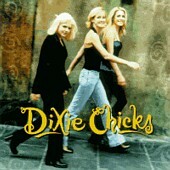 What made me fall in love with the Chicks is their vocal harmonies. They could sing a cappella and Id still be impressed. It is also commendable that two of them play some of the music featured. However, most of the songs are written by others; you still have to admire them for picking great songs to sing. They even use a song written by Bonnie Raitt, "Give It Up or Let Me Go," which is very spunky and full of attitude. Erwin and Seidel do collaborate to write "You Were Mine," which is about a woman who is trying to get over the fact that her husband has found a new love. They ask in harmony, "What right does she have to take you away, when for so long you were mine." This album is upbeat for the most part, their singing about love , relationships, and life is very cool. For those who dont listen to country music very much, even you will be delighted.